This project, which is my PhD topic, develops guidelines for a future device type: a tablet that allows ergonomic front- and back-of-device interaction. These guidelines are derived from empirical studies and developed to fit the users’ skills to the way the novel device type is held. Three particular research areas that are relevant to develop design guidelines for tablet interaction are investigated: ergonomic gestures, interaction areas, and pointing techniques. Corresponding publications are listed below. The main contributions of this dissertation are concentrated in a set of guidelines for the design of hand-held tablet devices’ interfaces on both device sides. These guidelines aim to help designers and developers of user interfaces to build ergonomic applications for tablet devices, in particular for devices that enable back-of-device interaction. Furthermore, manufacturers of tablet devices may obtain arguments that back-of-device interaction is a promising extension of the interaction design space and results in increased input capabilities, enriched design possibilities, and proven usability. My dissertation has been done at T-Labs at the Technical University Berlin under supervision of Sebastian Möller, Michael Rohs, and Joachim Sauter. 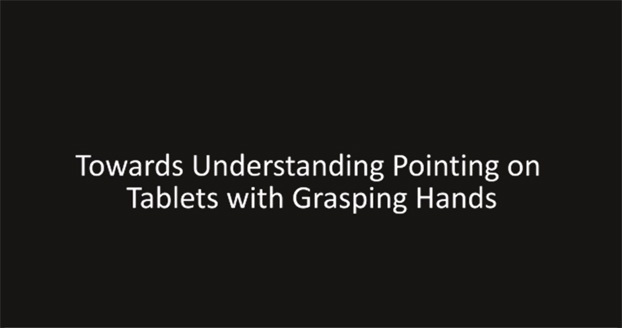 Katrin Wolf, Markus Schneider, John Mercouris, and Christopher-Eyk Hrabia: Biomechanics of Front- and Back-of-Tablet Pointing with Grasping Hands. In International Journal of Mobile Human Computer Interaction (IJMHCI 2015). 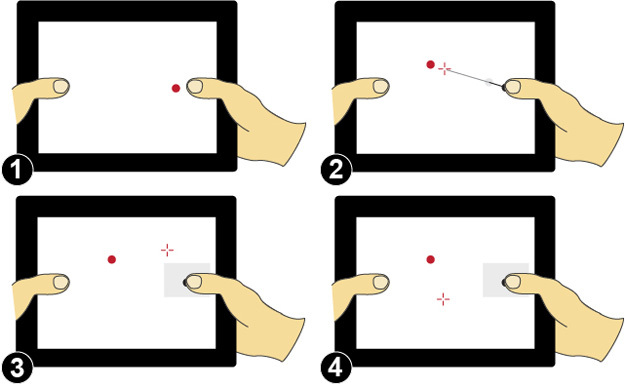 Katrin Wolf, Robert Schleicher, and Michael Rohs: Ergonomic Characteristics of Gestures for Front- and Back-of-Tablets Interaction with Grasping Hands. In Proceedings of the International Conference on Human Computer Interaction with Mobile Devices and Services (MobileHCI 2014). Katrin Wolf and Niels Henze: Comparing Pointing Techniques for Grasping Hands on Tablets. In Proceedings of the International Conference on Human Computer Interaction with Mobile Devices and Services (MobileHCI 2014). Katrin Wolf, Robert Schleicher, and Michael Rohs: Touch Accessibility on the Front and the Back of held Tablet Devices. In Proceedings of EuroHaptics 2014. Katrin Wolf, Robert Schleicher, Sven Kratz and Michael Rohs: Tickle: A Surface-independent Interaction Technique for Grasp Interfaces. In Proceedings of the International Conference on Tangible, Embedded and Embodied Interaction (TEI 2013), 185-192. Katrin Wolf, Christian Müller-Tomfelde, Kelvin Cheng and Ina Wechsung: Does proprioception guide back-of-device pointing as well as vision? In Proceedings of the ACM annual conference extended abstracts on Human Factors in Computing Systems Extended Abstracts (CHI 2012), 1739-1744. Katrin Wolf: When hand and device melt into a unit: microgestures on grasped objects. In CHI Extended Abstracts on Human Factors in Computing Systems (CHI 2012), 959-962. Katrin Wolf: Design space for finger gestures with hand-held tablets. In Proceedings of ACM international conference on Multimodal interaction (ICMI 2012), 325-328. Katrin Wolf, Christian Müller-Tomfelde, Kelvin Chen, Ina Wechsung: PinchPad: performance of touch-based gestures while grasping devices. In Proceedings of the International Conference on Tangible, Embedded and Embodied Interaction (TEI 2012), 103-110. Katrin Wolf: What I grasp is what I control: interacting through grasp releases. In Proceedings of the International Conference on Tangible, Embedded and Embodied Interaction (TEI 2012), 389-390. Katrin Wolf, Anja Naumann, Michael Rohs, and Jörg Müller: Taxonomy of microinteractions: defining microgestures based on ergonomic and scenario-dependent requirements. In Proceedings of IFIP TC international conference on Human-computer interaction – Volume Part I (INTERACT 2011), 559-575.